This entry was posted in Hardware, Software on July 1, 2013 by Raghavendar T S.
We all know about computer storage devices namely volatile and nonvolatile storage. Non-volatile storage devices stores the data even during the device is powered off and on the other hand volatile storage devices do not store the data when it is powered off. Hard disks or hard drives used in desktops and laptops are best examples of non volatile storage devices. Solid-state disk(SSD) is another non volatile storage device which is newer technology and gaining popularity for its increased performance compared to the normal hard drive. The performance of the storage devices can be measured with read and write rates.i.e the speed at which the data are read and write from the storage device. Currently SSDs are commercial storage device which offers very great performance but with greater price tag. Random Access Memory(RAM) is the best example for volatile storage. The computers which we are using today comes with lot or RAM usually 8GB or 16GB and even 32GB or 64GB in high gaming systems and workstations. Are we using that full amount of memory? Actually the answer is NO except for the few cases like gaming and that too playing a high end game like Crysis (Crysis series) and Battlefield 3 will push the memory usage to the max of 8GB to 10GB. What happens to the rest of the memory(RAM). Of course it remains unused? This is the case even when we are doing daily computer activities like browsing the internet or when running graphic intensive applications like CAD or video editing or anything. Is there a better way to utilize the unused memory and that too with higher performance than SSD and hard disk? YESSSSSSSS!!!! Random Access Memory(RAM) are the fastest storage devices compared to SSD and hard disk.But RAM is volatile storage. AMD Radeon RAMDisk is a new and innovative software solution from AMD which enable the user to create virtual drive from the RAM(a part of the RAM can used to create virtual disk). We can run any application or game from the virtual drive created from Radeon RAMDisk which makes the applications or games run faster than when it run on hard disk or SSD. Virtual drive created from Radeon RAMDisk makes the user to store any data as if the data been stored in normal hard drive or SSD and can be accessed in similar way what we do in normal hard drives or SSDs. So now we are using volatile storage as a non volatile storage with Radeon RAMDisk which increases the performance of the applications or games and we are able to utilize the full capability of the system without wasting the precious memory available in RAM. For an application or game to run, the required files will be transferred to and fro from the hard disk and RAM. In Radeon RAMDisk the entire RAM is split into virtual drive(RAMDisk) and RAM. 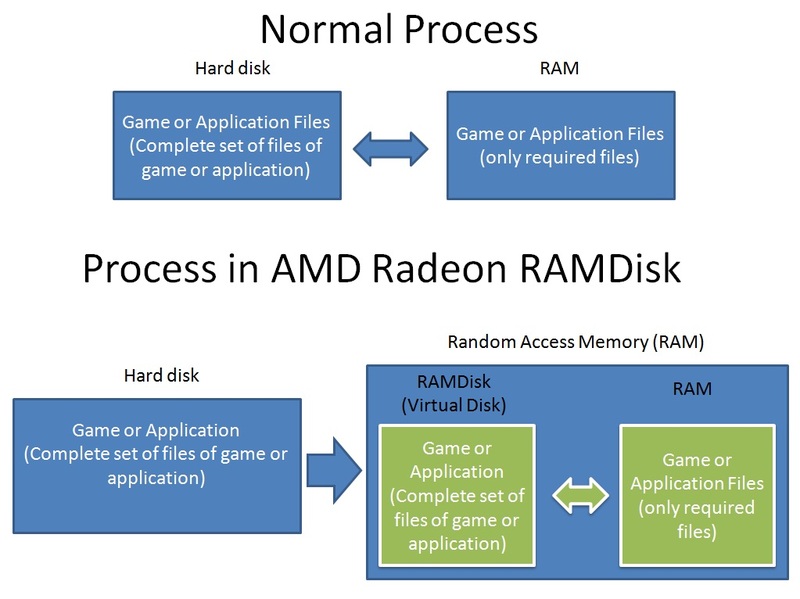 With Radeon RAMDisk, the entire content of the game or application will be create as virtual disk(virtual disk is the memory in RAM) and that virtual disk will act like a local hard drive. Now when we run the game or application from the virtual drive, the required data will need to be transferred to and fro from within the RAM i.e from the virtual disk and the RAM which makes the process faster than current generation SSD. From the above benchmark details from AMD, we can see a great performance improvement in RAMDisk compared to the hard drive and SSD. The benchmarking tool used in Crystal Diskmark. AMD Radeon RAMDisk is available for free with which you can create RAMDisk(virtual disk) upto 4GB. The commercial version of AMD Radeon RAMDisk costs $14.99 with which you can create RAMDisk upto 32GB and the Radeon RAMDisk with price tag $18.99 enable us to create RAMDisk upto 64GB. AMD Radeon RAMDisk can be used with memory modules from any manufacturer.